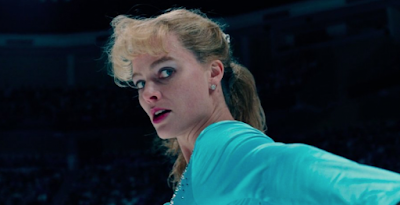 The veracity of what former figure skater Tonya Harding says she did and did not know regarding the attack on Nancy Kerrigan ahead of the 1994 Winter Olympics has always been in doubt, and director Craig Gillespie and screenwriter Steven Rogers take this lack of truth as gospel for “I, Tonya”, which is less a traditional biopic than, shall we say, mockudrama given how Tonya Harding (Margot Robbie) and her spouse Jeff Gillooly (Sebastian Stan) and assorted others give after-the-fact interviews throughout the film. These talking heads explicitly question the truth of what others say, sometimes in side-by-side frames, and occasionally Gillespie even has characters break the fourth wall to explain that what they are in the midst of doing did not really happen. Rather than one unreliable narrator, in other words, “I, Tonya” has several. 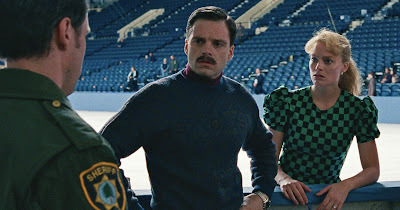 The problem, however, is that too often Gillespie and Rogers come across equally intent on portraying Tonya as misunderstood. That’s not necessarily wrong, but it also forces the film to often opt out of its intentional untrustworthiness to sympathize with Harding, only to then never substantially dig into her psyche anyway. Like the obtuse plan to attack Kerrigan, “I, Tonya” is not really thought through. Those inconsistencies trickle down to the figure skating, which would seem paramount in a movie about a figure skater but is so insufficiently explored we are mostly left to assume her considerable talent was inborn. That’s because Gillespie renders the long hours Harding spends on the ice as less about strategy and training than mental and physical abuse at the hands of her mother, LaVona, a startling, wicked performance by Allison Janney that tells empathy to eff off. This cruelty makes painfully clear why Tonya would have wound up with the infamously monikered and physically cruel Gillooly, evoked in how they do not so much build a relationship as just plunge right into it. It also explains why she would stick with a sport that seems so intent on telling her she is not right the type, glimpsed in a scene where she marches right up the judges to tell them off, only to return again and again to suffer their hypercriticism, as if she craves the abuse. And it is abuse which emerges as the “I, Tonya’” foremost subject. Yet in fashioning an unreliable narrative, Gillespie and Rogers conveniently allow themselves to eschew an earnest reckoning with their prominent theme, alternating between sober and comic renderings of the cruelty depending on what sort of emotion they seek to extrapolate from the audience. And while the abuse committed upon Tonya might well be intended as commentary on how she became a victim of the American public and media, particularly in the wake of the attack on Kerrigan, that’s an allegory the movie fails to draw in any real way, falling back on the present day Tonya simply saying it. That “I, Tonya” seeks to present its subject as a victim is most explicitly, and paradoxically, gleaned in the scenes recounting Kerrigan’s injury when the narrative is essentially handed off to Gillooly and his dimwitted accomplice Shawn Eckhardt (Paul Walter Hauser). If some of these passages, like the lunk-headed Shane Standt’s attack on poor Kerrigan, in which his headbutt through the glass of a locked door is an extraordinary comic climax, achieve an epic doofery, too many others feel like a mandatory checking off of plot points. Even worse, the whole passage feels bizarrely weightless because of its conspicuous and damning lack of Tonya. While “I, Tonya” is willing to obfuscate the credibility of all the abuse its titular subject is made to endure, it is unwilling to compromise on her involvement in the Kerrigan capers, deliberately sidelining her to ensure she is not implicated in the crime, a flouting of its own supposedly unreliable narrative. Still, contending she was not involved contributes to the movie’s most on point sequence, the fateful skate at the 1994 Olympics in which her shoelace coming undone becomes a metaphor for her life unraveling. If it’s an obvious metaphor, it works not only because Gillespie blows it out to levels of operatic tragedy but because he limits the perspective to just Tonya, as if this is how it played to her. It is not necessarily believable but still true to what she believes, and at this pitch “I, Tonya” might have worked had it not fallen prey to the very thing it contends Tonya fell prey to – the perceptions and voices of so many others.